A group, Voice of the People (V2P) and Hope Givers Initiative (HOG-1) have claimed that only low percentage of the 69 roads and bridges projects the federal government listed as ongoing in the South-east geo-political zone have been completed. Faulting the claim by the Minister of Information, Lai Mohammed, in August 2018, that the 69 projects are nearing completion, the report produced after a monitoring and verification exercise of the projects, claimed that an insignificant percentage was completed. The 80-page report made available to newsmen in Abuja stated that; “43.28 per cent of the projects were either uncompleted and abandoned or not started at all as at October 31, 2018”. “Equally important is the fact that 8.96 per cent of the projects have been completed and in use but in very bad shape currently, while 1.49 percent of the projects in the list have been completed but unfortunately these projects have failed and collapsed. “The claim by the Minister of Information that the 69 projects in the list are ongoing cannot be true because the monitoring exercise found out that 23.88 per cent of the projects on the released list are ongoing with substantial work done while 11.94 per cent of the projects have work just resuming. In other words, ongoing projects in the released list constitute only 35.82 percent of the 69 projects. “This implies that the percentage share of ongoing projects is lower than the percentage share of uncompleted and abandoned projects or projects not started at all which constitute 43.28 percent of the 69 projects in the released list of supposedly ongoing projects in the South East Zone,” the report said. Analysis done by the two NGOs show that the highest number of projects accounting for 31.88 per cent of the 69 projects were in Enugu State followed by Anambra State with 27.54 per cent, Abia State accounts for 17.39 per cent, Imo State with 14.49 per cent while Ebonyi State has the least number accounting for 5.80 percent of the 69 projects. 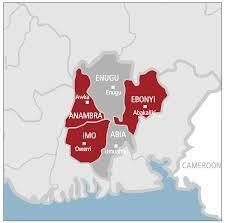 According to the report, Abia and Imo states have the highest share of 50 per cent of their projects in the released list either started and abandoned or not started at all followed by Enugu with 45 per cent, Anambra with 42.11 per cent while Ebonyi state has no project in the released list in this category. The report explained that Ebonyi State has the least number of four projects which have been completed, in use and in good condition even though community members interviewed during the verification exercise said that the road projects were actually executed by the state government but that contractors from the Federal Government only worked on the road shoulders. Observations made by the NGOs showed that 40.58 percent of the projects were awarded during the Goodluck Jonathan’s administration, 28.99 per cent during the current administration, 23.19 under Shehu Yar’Adua administration, 4.35 per cent during Olusegun Obasanjo administration, while 2.90 per cent cannot be classified under any administration.